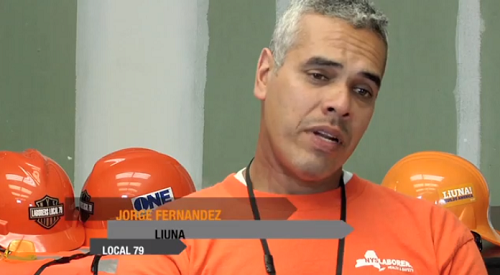 Washington, D.C. (September 11, 2013) – On the anniversary of the 9/11 attacks, LIUNA has released a video series featuring seven LIUNA members who participated in the 9/11 response and are now rebuilding the World Trade Center. The videos honor those who were lost and celebrate the rebuilding of the World Trade Center. “I saw the second plane hit. A lot of people we worked with lost family members. It means a lot to be here. We are not going to let what happened affect us,” said LIUNA member Michael Saich. Watch: Renewing Lives—Rebuilding the World Trade Center.